Strawberry days 2009 was a huge success I love it! It my favorite thing about Pleasant Grove. 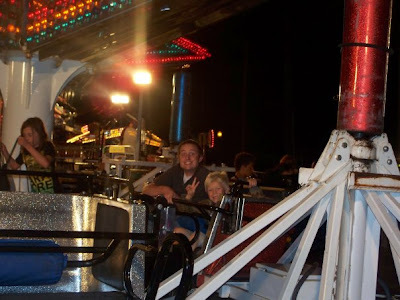 Wednesday night Mike and I took my little brother Dane to the carnival. Mike had never rode the carnival rides poor kid! I have puked on a few mis fortunate people in the past years so I just watched and let Mike be a good brother-inlaw lol. Dane loved the zipper it was his first time on it too. We got some strawberries and cream mmm so good if you've never had one your missing out! Thursday night we went to the rodeo with Kristen and Nate, Amy and Matt, Kirsten and her guy and Haley. It was a lot of fun I love the rodeo the beautiful horses the cowboys and the smell of cows. :) Friday night we went to the rodeo with my family and Saturday night we went to the rodeo with Mikes family. It was so much fun I can't wait till next year. I know that some day Mike and I will move away, but I know that one week of the year we will always come back to good ole strawberry days.